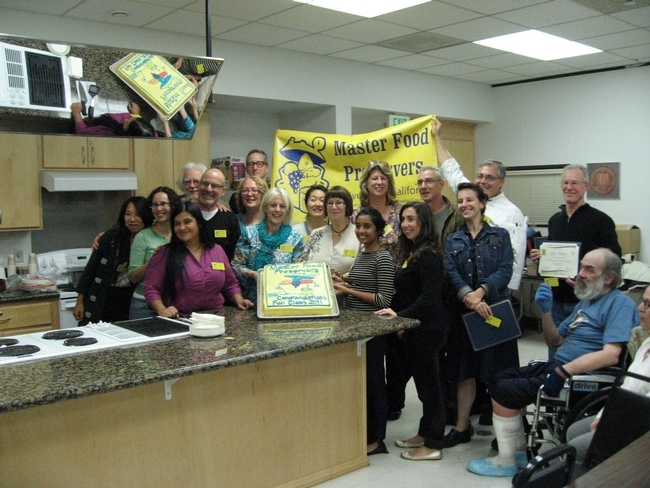 Los Angeles County Master Food Preservers Fall Class 2011 Graduates! 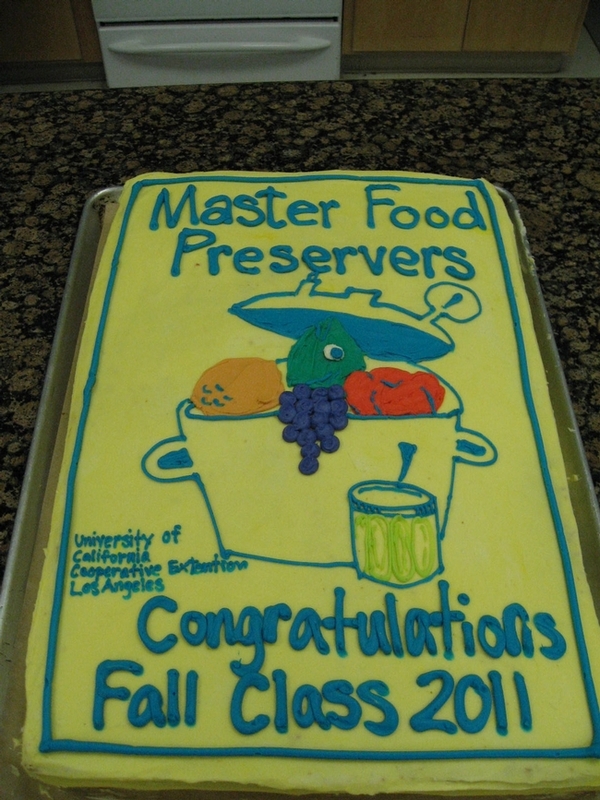 The Fall Class of UCCE Los Angeles Master Food Preservers held its graduation on Nov. 22, with a wonderful potluck, a beautiful cake, some great looking badges and graduation certificates, and an attitude of community-minded giving in our futures. Our Silent Auction is indebted to the contributions made by the manufacturer of the All-American Pressure Canner (21.5 QT), a donated item of great value which launched a bidding frenzy; and the Thermoworks Thermapen and 2 Pocket Thermometers fetched higher-than-retail bids. The donations also came from classmates, including a two hour Indian food class, lovely gift bags from SQIRL and Santa Monica Farmers Markets, an amazing lamb cake mold, delicious preserved jams, butters and jellies, exquisite cheeses paired with wines, books and more. We had a demonstration of antique mason jars as well, and what a beautiful sight they were! PS: that cake (not preserved!) was baked by Chef Ernest Miller, of Hollywood Farmers Kitchen, without whom the program would not have been revived. We also thank UCCE's Dr. Rachel Surls for providing the means to make its revival a reality. Now it's up to us, the graduates, to grow it and share it with our community. I have just graduated with a class of remarkable people -- we'll make it happen! Congrats to everyone in the class; I hope to join your number next year!